5, 10, 18, 25, 36 and 52 cu.ft. working capacity. Each of the Blenders is constructed in type 304 stainless steel and is polished to a smooth 80 grit finish on the exterior and interior surfaces. Standard manually operated slide paddle valves located in the bottom center of the trough are included. 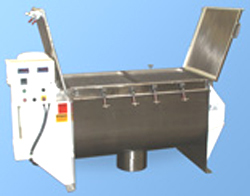 The blenders are driven by right angle reducers to accommodate bulk densities up to 32 pounds cu.ft. Ross manufactures a range of sizes from ½ through 515 cu.ft. working capacity. Ross blenders are supplied with several agitator design possibilities including continuous or cut-out ribbons for center or end discharge, a paddle design is also offered for shear sensitive blending applications. Standard options include sanitary stuffing boxes, jackets for heating or cooling, vacuum or pressure design, sanitary construction, covers to meet a clients production needs and torque controlling couplings for full load starting. Testing is available on a pilot plant five cu. ft. model installed in the Ross test Center.